I promised a recipe this week, and I always deliver on my promises. Before I get to that, though, I wanted to take a moment to thank you for being with me through my last few heavy posts. It warmed my heart to see the outpouring of love and healing thoughts for my friend who recently experienced the devastating loss of her baby. I promise you that each note, well wish and prayer for healing are being sent to her and her family. Keep the good vibes and positive energy flowing!! And now – the food! I love food! Who doesn’t? My mom always used to say that “summer is the best time of the year to eat!” You may or may not agree with this but it’s hard to argue with all the delicious fruits, melons and berries we get in the summertime. I look forward to summer tomatoes all year long. I’ve shared with you before about how much I love tomatoes. I love eating them all kinds of different ways, and one of my very favorite ways is to use them as a base for a classic summer soup, gazpacho. Gazpacho has long been one of my very favorite things to eat in the summer. Native to the Iberian Peninsula, I ate gazpacho for the first time on a trip to Spain in 1997. I was hooked; ever since then I’ve eaten traditional red gazpachos, green gazpachos, thick, chunky gazpachos, thinner, puree-like gazpachos, and gazpachos mixed and matched with many different vegetables – even a gazpacho made from watermelon! Traditional red gazpacho that uses tomatoes as a base can be a real boon to our fertility, especially for men. Tomatoes contain lycopene, an antioxidant that helps improve sperm health, including that all-important sperm count. Lycopene also has a positive effect on sperm morphology (structure) and motility (speed), which is also important for the swimmers. Lycopene can benefit women also, as some studies suggest that it can help treat endometriosis, so if you have this condition, this is great news for you! Tomatoes are also a great all-around fruit for healthy nutrition and boosting our fertility. They’re a good source of Vitamins A, C, K B6, folate and fiber, among other nutrients, that help balance our hormones and improve our ovulation. They’re also beneficial for heart health, cholesterol, and overall health. 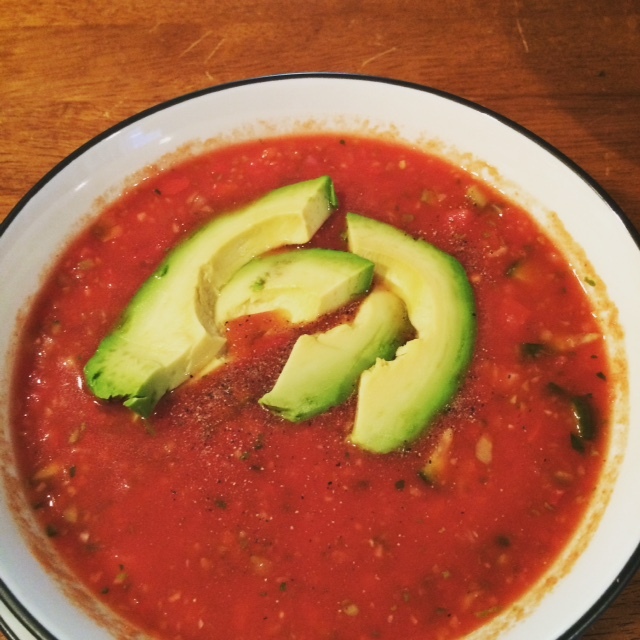 Gazpacho violates one of my key criteria for cooking – as you know, I love to make things that are 5 ingredients or less, 5 steps or less – gazpacho has way more than 5 ingredients. In fact, the chunkier you make gazpacho by putting more ingredients into it, the better it is! But once you get all that chopping done, it’s super easy to make – really only one step and takes less than 5 minutes! In a food processor or blender, pulse the ripe tomatoes with the garlic, olive oil and red wine vinegar. Add half of the Roma tomatoes, cucumber, zucchini/squash, celery, red onion and pepper. Pulse until all ingredients are blended well. It will be colorful! Pour into a large bowl. Add the rest of the ingredients, and stir, season with salt and pepper to taste. If you want it a little zingier, add a dash of Tabasco sauce. The colder you eat this soup the better, so it’s best to make this a day ahead, and chill in the refrigerator. That way all the flavors have time to really meld too. When removing from the fridge, adjust seasonings again to taste. Ladle into bowls and garnish with chopped avocado and parsley. There’s nothing like a bowl of yummy gazpacho to hit the spot on a scorching summer day! You May Like Healthy. Quick. Simple.